The end of a quarter usually means, for those of us in the deal space, receiving various emails updating us on global M&A activities. Today was no exception with, notably, Thomson Reuters and Merrill DataSite reps hitting my inbox with links to their interesting reports (here and here for easy reference). Both reports gives us nice graphs and color commentaries on major markets’ activity and the Merrill/MergerMarket one even sums it up a bit more with maps showing how much was invested by country. The news aren’t really that shocking: M&A activity is slightly down over last year and we’ve seen less IPOs while follow-on offerings are at an all-time high, resumes Thomson Reuters. This brings us to the Unicorns. Discussed at length in news outlets over the last year or so, VCs tend to lean more and more toward holding their positions longer and even raise funds focused exclusively on later-stage funding and growth capital for mature companies. This trend as led to many startups with valuations of $1Bn+ opting to remain private as finding growth capital has been less of an issue lately. So much so that there’s even a term for them: Unicorns. This trend has, obviously, contributed to the decline in IPO volumes. CB Insights keeps updated a list of Unicorns. To date, they list 140 of them in case you were wondering. For the record, SoFi, an online lender focused on student loan consolidation, has entered the closed Unicorn group yesterday, closing a $1Bn round led by Softbank and, thus, pushing away IPO plans. This Series E round (5th institutional round) pushes SoFi’s funding to $1.42Bn. It makes me wonder a bit how the 400 full-time employee company will put this freshly cashed in, $1Bn to good use and what was the return it was bring to Softbank and others in a short/medium term. Don’t get me wrong, I think that SoFi is a great company and I am also a strong believer that it has a lot of space to grow too. I just think that the size of the valuation rounds we see lately have more to do with the abnormally high liquidity we currently see in the markets than it has to do with common business sense. Tech is trendy and brings what one might call ‘ridiculous’ valuations or, at least, unreasonable. Let’s take American Airlines (AAL) and Facebook (FB) as an example. AAL 34.35 +0.25 +0.73% has a market cap, at the time of this writting, of $26Bn for $42Bn in Revenues and $4.2Bn in Net Income ($8.0Bn EBITDA). Adding debt, it is valued at 4.5x EBITDA. FB 135.06 -8.61 -5.99%, on the other hand, has a market cap, at the time of this writting, of $252Bn for $15Bn in Revenues and $2.7Bn in Net Income ($6.4Bn EBITDA). Adding debt, it is valued at 39.9x EBITDA. Now, here’s the thing, as of June 30, 2015, American Airlines had over $25Bn in Fixed Assets + $14Bn in Current Assets whereas Facebook’s largest asset was its Goodwill for $18Bn. Sure, AAL also has a lot more debt than Facebook. Nonetheless, my point here is that American Airlines, a rather ‘traditional’ business, has on its books tangible assets worth 2x its market cap and generates twice the Net Income that Facebook generate but trades at a tenth of Facebook’s valuation. Great for Facebook some will tell me. Sure, I’m just concerned that the ‘value’ in Facebook is, for a large part, air. Should XYZ Co. displace it as a (the?) leading online destination, much like Google did with Yahoo (or Facebook itself did with MySpace), many investor will be left in the red. I believe the Unicorn situation is similar. Currently, there’s a lot of capital available and rather volatile or poor returns in traditional investment platforms, so the appetite for riskier but juicier investments is high and, thus valuations are increasing. I’m basically describing a bubble. On the other side, we have the world’s largest economy, China, and other fast-paced economies – Brazil, Russia, etc. – slowing down and conflicts in the Middle East every day closer to erupting in was could be a third world war… I hope I’m wrong but I feel that a market contraction – or recession – could be coming very soon, leaving various of those unicorns (and their investors), in a bad position. 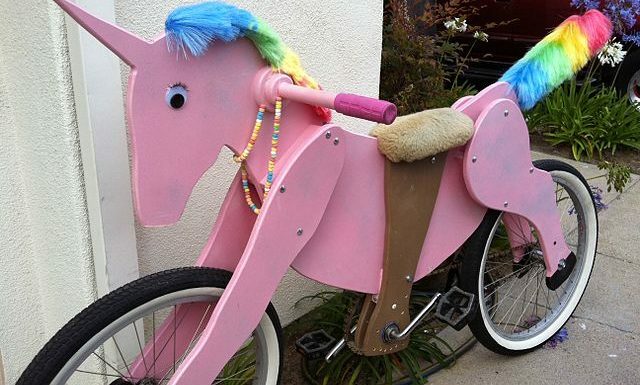 Image Credits: "Pearl the Unicorn Bike" by Thespeakerguy – Own work. .